RIGIL KENTAURUS (Alpha Centauri) with PROXIMA CENTAURI (Alpha Cen C). Among the most famed stars of the entire sky, surely rival in renown to Sirius and Polaris even though not visible to much of the world's population, is the "foot of the Centaur," Rigil Kentaurus, "Rigil Kent," the first star of Centaurus, probably much better known as Alpha Centauri or just Alpha Cen. Its fame, indeed that it is the third brightest star in the sky (after Sirius and Canopus), lies not in its extreme characteristics but in its geometry, as it is the closest star to the Sun, lying a mere 4.32 light years away, the distance known to 0.4 percent. Placed well down in the southern hemisphere, in fact the most southerly of naked eye stars, it cannot be seen above about 30 degrees north latitude, making it one of the great luminaries of the southern hemisphere. Alpha Cen deceives the eye. Through but a modest telescope we see it as double. The brighter is a yellow class G2 hydrogen-fusing dwarf star that, with a temperature of 5790-5850 Kelvin (a bit warmer than the solar temperature of 5780 K), appears almost identical to our G2 Sun, certainly an odd coincidence. The companion, over a magnitude fainter, is a cooler (5260-5320 Kelvin) class K1 dwarf, the two making an obvious color contrast. The pair orbit each other every 79.9 years. Though they average 23.2 Astronomical Units apart (21 percent farther than Uranus is from the Sun), the elliptical orbit sends them from a farthest distance of 35 AU to 11, just over Saturn's solar distance. Because of Alpha Cen's proximity, the brighter component is still of the zeroth magnitude (-0.01), and would by itself be the sky's third brightest star, the secondary, at first magnitude (1.33), coming in at number 21. The orbit and orbital speeds yield masses of 1.10 solar for the brighter star, 0.92 for the fainter (as expected for ordinary hydrogen fusing stars on the "main sequence"). The orbit of Alpha Cen B about Alpha A (at the cross, the two actually revolving around a common center of mass between them) is among the most precisely known, the two taking 79.9 years to make a mutual circuit at an average separation of 23.1 Astronomical Units. The scale is in seconds of arc. The considerable eccentricity is exaggerated by an orbital tilt of 79 degrees to the plane of the sky, which also offsets Alpha Cen A from the ellipse's focus. The two were last closest together (11 AU apart) in 1955. From the Sixth Catalog of Orbits of Visual Binary Stars , W. I. Hartkopf and B. D. Mason, US Naval Observatory Double Star Catalog, 2006. While the stars have been extensively studied (with techniques that include "asteroseismology," observation of rapid oscillations), the resulting parameters, especially the system's age, have been subject to some disagreement. Respective luminosities of Alpha Cen A and B fall around 1.52 and 0.50 times solar. Metal contents have ranged from solar to as much as 1.8 times that found in the Sun, with the latest results settling in at 1.5 and 1.6 times solar. 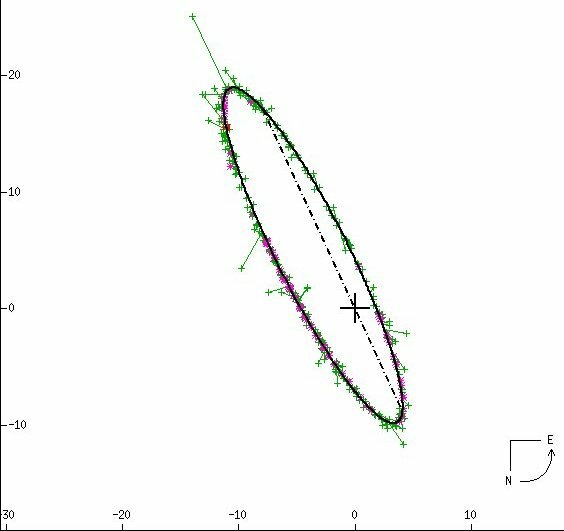 Direct measure of radius through interferometry gives a radius for Alpha-A of 1.21 solar and for Alpha-B of 0.85 solar, consistent with that derived from luminosity and temperature. Age estimates have ranged up to as much as 8 billion years, though the most recent values line up at around 4.8 billion years. While that value is similar to the Sun's age of 4.6 billion years, Alpha Cen A is still notably "older" relative to the star's seven billion year hydrogen-fusing lifetime. With a rotation period similar to that of the Sun (Alpha Cen A the same, Alpha Cen B 40 percent longer), both have hot magnetically heated X-ray coronae. Both also show activity cycles of a few years, Alpha Cen A's activity recently fading away. Alpha Centauri has yet another member, a faint eleventh magnitude (11.05) companion called "Proxima" that is a huge 1.85 degrees (at least 8500 AU) away from Alpha proper and that orbits with a period of at least a three-quarters of a million years. If indeed it does orbit (and that is not certain), it is now on the near side of its path and some 6,000 astronomical units closer than the bright pair, making it actually the closest known star (but since it is part of Alpha, surely it is still fair to call Alpha the closest star). As a mid-class M (M5.5) dwarf star, Proxima is faint indeed, to the eye 18,000 times dimmer than the Sun. From Alpha Cen proper, Proxima would appear as only fourth magnitude, about as bright as the faint stars of the Little Dipper appear to us. When infrared radiation produced by its 3040 Kelvin surface is accounted for, it is seen to be more luminous, but still only 1/600 as bright as the Sun (and 15 percent the size), the result of a mass only 12 percent solar. 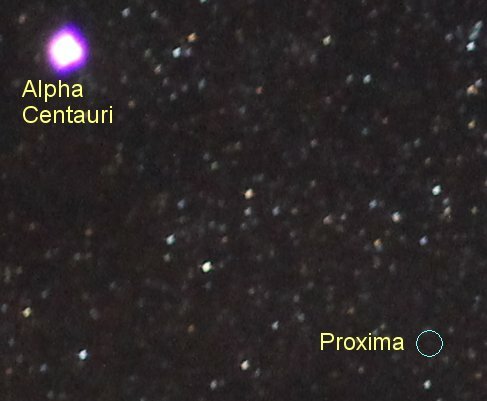 The picture reveals the striking difference between zero-magnitude (-0.29) Alpha Centauri and nearly its two-degree-distant and vastly fainter companion, Proxima Cen, which at 11th magnitude (11.05) is just barely visible within the circle. Alpha is a double made of a sunlike class G2 dwarf coupled with a fainter class K1 dwarf (the two too close together to be resolvable here). But three-quarters of Alpha's light comes from the sunlike star, so the close class K companion does not make much difference. The picture then really shows the dramatic difference in luminosity made by stellar mass and temperature. Proxima, a mid-class M dwarf carrying 12 percent of the solar mass, is to the eye some 18,000 times fainter than Alpha Cen A (which is just 10 percent heavier than the Sun), in part because much of the light from Proxima's 3040 Kelvin surface is radiated in the invisible infrared. Even when the infrared is factored in, however, in total luminosity, Proxima is still about 600 times fainter than the Sun. While the systems's chief component is best known as a solar analogue, Proxima is famed as a dwarf class M "flare star," one that suddenly erupts with fearsome violence as a result of the collapse of its complex and unstable magnetic fields. There is some evidence for a magnetic activity cycle in spite of a slow rotation (which with up and down convection generates the magnetism) period of 84 days. As do many red dwarfs, Proxima Cen has its own planet. With a mass at least 1.3 times that of Earth, Proxima b orbits Proxima proper every 11.2 days at a distance of about 0.05 Astronomical Units, which places it in the "habitable zone," where we might have liquid water. A "planet" previously discovered about Alpha Cen B dows not exist Only from Rigil Kentaurus would our Sun have any kind of magnificence. Since the star is close to us, its inhabitants, were it to have any, would see much the same constellation patterns that we do except that Centaurus would be missing its brightest star and the stars that lie between Cassiopeia and Perseus would be the setting for our first magnitude Sun, which would be the eighth brightest in their sky. Written by Jim Kaler 6/04/99; latest revision 11/7/16. Return to STARS.